Chris Bray grew up sailing round the world and then leading world-first arctic expeditions before becoming an award-winning Australian Geographic photographer, Lowepro ambassador and Canon’s Australian ambassador for five years. Chris’s work has appeared in everything from National Geographic (as well as Australian and Canadian Geographic) to TIME Magazine and Discovery Channel. He’s written a successful book 'The 1000 Hour Day' (now an award-winning documentary "The Crossing"), is a councillor of The Australian Geographic Society and also founder and CEO of Conservation United, crowd-funding the world’s critical conservation projects. Together with his wife Jess, they recently became the first people to sail a junk-rig boat through the Northwest Passage over the arctic. 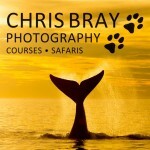 Chris Bray Photography runs exclusive Photo Safaris to the world's most wonderful places and is the largest Photo Safari operator in Australia.